Gotview USB DVB-S2 Satellite HD Receiver, External computer DVB-S2 receiver with interface USB 2.0. Used to watch satellite TV, as well as the use of satellite Internet. Included is a remote control. 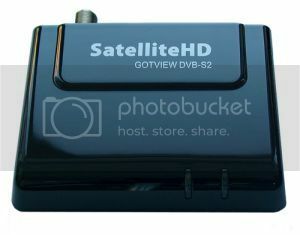 Proprietary software receiver Satellite HD Gotview USB DVB-S2 is quite functional, it allows you to use supports the DiSEqC 1.1. The driver supports all popular 32-bit and 64-bit operating systems Windows, and adapted based on compatibility with alternative programs and software providers. The program has a flexible adjustment of the decoder is used, so you can customize and use the best (including commercial) decoders to improve image quality and reduce system load. It is possible to distribute satellite TV in the Network! Selector M88TS2020, demodulator M88DS3000, USB controller CY7C68013A. Stable reception of weak signals. Support extreme symbol rate of 2-45Ms / s.
Universal acceptance of these standards in satellite DVB-S and DVB-S2. Support for high definition television HDTV (MPEG-4/AVC). Support for all providers of satellite internet. BDA-driver compatibility allows you to use virtually any third-party software that works with DVB cards. Motored control (DiSEqC 1.2, 1.3/USALS). Frame grabber TV window by pressing a button. Manager held jobs for video recording at a specified time. Flexible adjustment of the capture. The ability to automatically change the file name. Broadcasting network in multicast or unicast. The ability to play recorded files without exiting the program, and directly during recording. The possibility of adjusting settings (change the brightness, contrast, etc.) directly during recording. The title of the current TV shows, as well as the start and end time of the transfer, indicating the length of time elapsed from the beginning. The ability to backup disk space for recording.